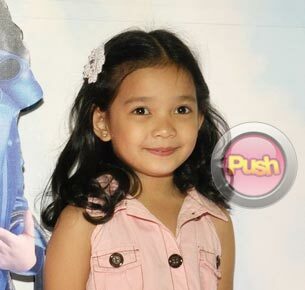 Child star Xyriel Manabat said she is really happy to star in the top-rating teleserye 100 Days To Heaven because it’s the kind of story that teaches viewers a lot of moral values. She was just worried that children her age would come to dislike her because of her mean character in the soap. “Opo, gusto ko po [mag-hit ulit itong show]. Sana panoorin niyo ang 100 Days to Heaven. Ito po ay kapupulutan niyo ng aral. Ito ay kwento ni Anna Manalastas. Iba siya sa Momay kasi dun makulit ako, sa Agua Bendita naman salbahe tapos mabait, tapos sa Noah, simple lang. Tapos dito salbahe ako,” said Xyriel in a recent interview with Push.com.ph. Is it safe to say that her celebrity crush is one of her textmates? “Meron akong crush, pero secret na lang yun,” she cheerfully added.